With like double the streusel. YES! I dunno about you guys, but I do believe that almost all muffins can be made better by adding a little streusel. 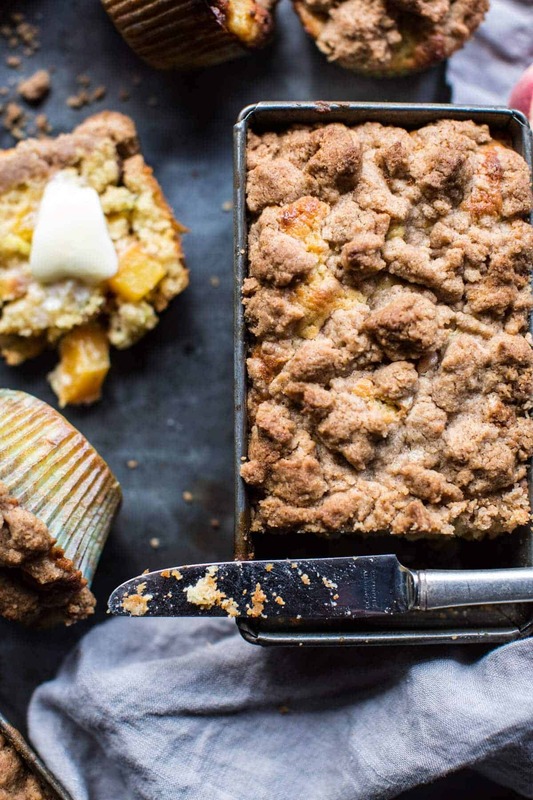 The combo of delicious buttery streusel with these moist peachy muffins just really works for me. Meaning I think these muffins are freaking DELISH. A little on the sweet side, but um, when could that ever be a bad thing?!? And hey, did you see… zucchini is involved, so that totally cancels out all the sugar in my mind…muahahaha. Question, are you guys sick of peaches? I am totally in peach mode. For me, the early summer months are all about berries + cherries, and the later summer months are all about peaches + zucchini. It’s no secret that the peaches always seem to be at their best come August, so clearly I needed to do a little baking with them. In all honesty, this is truly the first summer I’ve truly embraced baking with summer fruits. I know that sounds just so horrible, but as you guys well know, when it comes to baked goods, I’m typically an all chocolate kind of girl. BUT this summer has been different, I’ve been embracing the “sweet” brunch foods. OKok, so some of my sweet brunch foods really qualify as dessert to most people, but whatever. Mom’s a chocoholic, and to me, fruity things just do not feel dessert like. Anyway, I’ve really grown to love baking/cooking with fruits. I’m talking pies, scones, grilled peaches, cherry pancakes, peach fritters, peach crisp, etc. It has for sure been a fruity kind of summer!! Pretty soon I’ll be moving on to apples, but for today, it’s all about peaches! 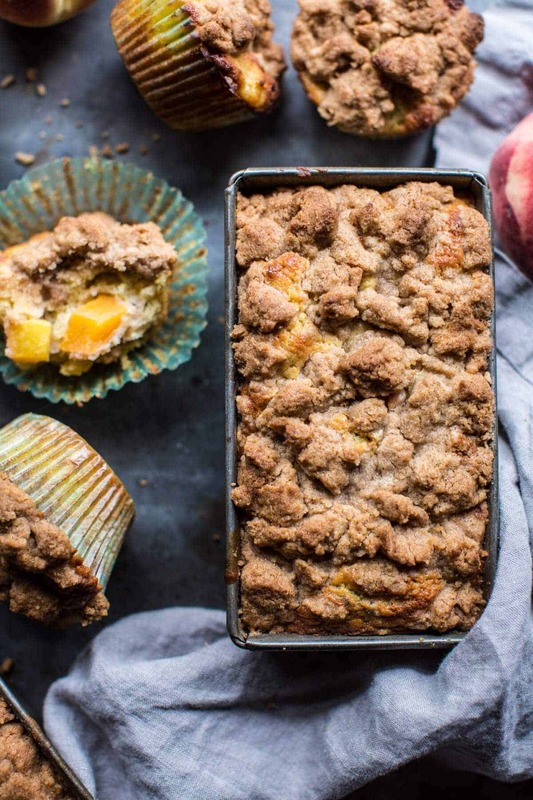 I’d love to say that these peach muffins have some amazing story as to how they came to be, but in all honesty, I really just had a whole bunch of peaches sitting on the counter that needed to be used. Sometimes I can get a little too exited when I see good-looking produce and I buy a little too much…either that or I went to the farm stand hungry, which caused me to buy more than I really needed. UGH. Tell me this happens to you guys too? So I had several peaches and a fridge full of zucchini, and then well, I just decided it was a muffin kind of day and went for it. 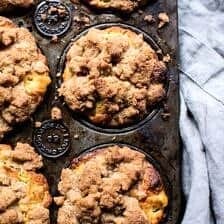 At first I wasn’t sure if you guys would think zucchini and peach muffins sounded totally weird, but then I asked all of my family members… repeatedly, and they all agreed zucchini peach muffins are where it’s at! About forty minutes or so later my kitchen smelled beyond amazing and I had warm muffins sitting on my counter. Let me just say that getting through this photo shoot without picking away at these muffins was brutal. I reasoned with myself at first, but then I declared one of the muffins too ugly to photography. That was that, gone in five seconds flat. 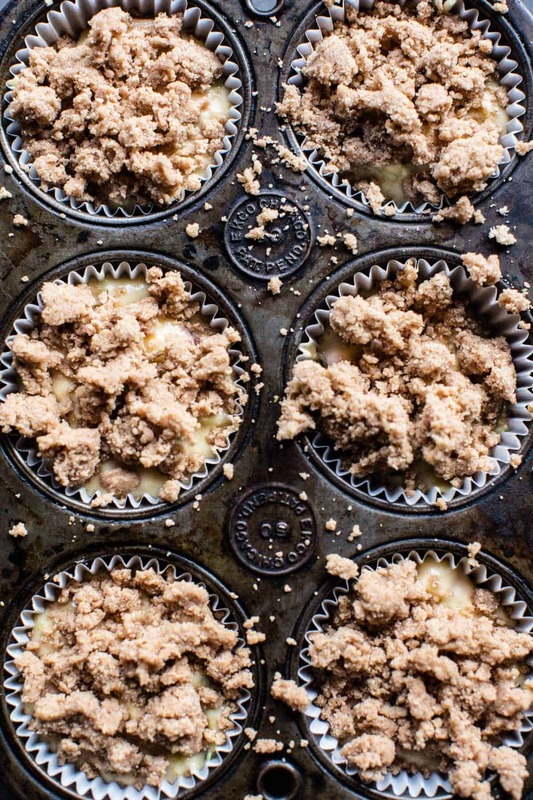 I feel like a lot of times you’ll see streusel muffins with a glaze, but these are perfect as it. No added sweetness is needed. Just maybe a cup of coffee or tea and you’ll have breakfast or afternoon snack perfection. These are amazing straight outta the oven while still warm, but even a couple of days after baking, they still taste delish. Really though, can you guys think of a better Tuesday treat?!?! I’m thinking that you have all got to make these, like ASAP. Before the peaches are all gone for the season…oh my gosh! BUT when the peaches are gone ?, you can always swap them for apples. YES. That will be pretty amazing too. 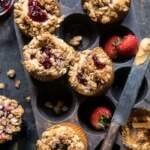 The combo of delicious buttery streusel with these moist peachy muffins just really works for me. Preheat the oven to 350 degrees F. Line a 12 cup muffin tin with cupcake liners or grease with cooking spray. Lay a clean kitchen towel on the counter and spread the zucchini out on the towel, cover with another clean towel and let sit 10 minutes. Meanwhile, combine the all-purpose flour, baking powder and salt in a large mixing bowl. In a small bowl whisk together the yogurt, coconut oil, milk, eggs, vanilla, brown sugar and sugar. Stir in the shredded zucchini. Add the wet ingredients to the dry and mix until just combined. It's ok if there are still some clumps. Stir in the the diced peaches. To make the streusel. In a small bowl, add the flour, brown sugar, cinnamon and butter. Mix together with your hands, until you have a crumbly mixture. Sprinkle the muffins evenly with the streusel topping. Place in the oven and bake for 20-25 minutes or until a toothpick inserted into the center comes out clean. Serve warm or at room temperature. PS. 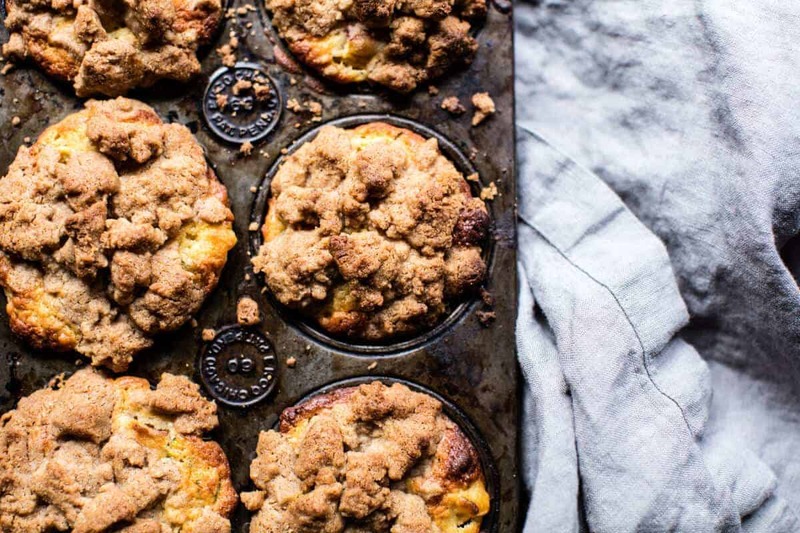 That streusel though… it. is. everything. k. bye! Looks delicious! I am do making these. Is it all purpose flour or coconut flour? The directions say coconut flour. Thank you! I am pretty sure it is not coconut flour. That has a completely different liquid ratio than any other flour. They would be very dry. Tracy! So sorry! The coconut flour is a typo. No coconut flour in the recipe. Recipe is now fixed. Hope you love these and let me know if you have questions. Thanks! In the ingredient list, you have regular flour however, in the directions you state to mix the flour AND the coconut flour. Hey Kris, So sorry! The coconut flour is a typo. No coconut flour in the recipe. Recipe is now fixed. Let me know if you have any questions. Hope you love these! HEY KATIE! So sorry! The coconut flour is a typo. No coconut flour in the recipe. Recipe is now fixed. So sorry about that! Yes, vegetable oil should work great in place of the coconut oil. Let me know if you have questions. Thank you! Saving this because it looks really good. Totally get what you mean about baking with fruits! And what a great idea to add zucchini too – I’m all about that late summer produce at the moment! Right?! So am I! Thanks so much Rhian! Yes, please clarify the flour issue! Also, how do you think these would freeze? Hey Melissa! So sorry! The coconut flour is a typo. No coconut flour in the recipe. Recipe is now fixed. So sorry about that! these will freeze great! Just be sure to wrap them tightly so they do not get freezer burn. Please let me know if you have questions. Thanks!! So I have all the ingredients on hand so I know what I’ll be making today! Haha that is awesome! I hope you love them! peaches and streusel are my favorite things in the world!! They are just so amazing!! Haha thanks Jessica! Oh man I have everything but the yogurt. I may try to use sour cream. I love peaches!! So do I! Lol! Thanks Charlotte! 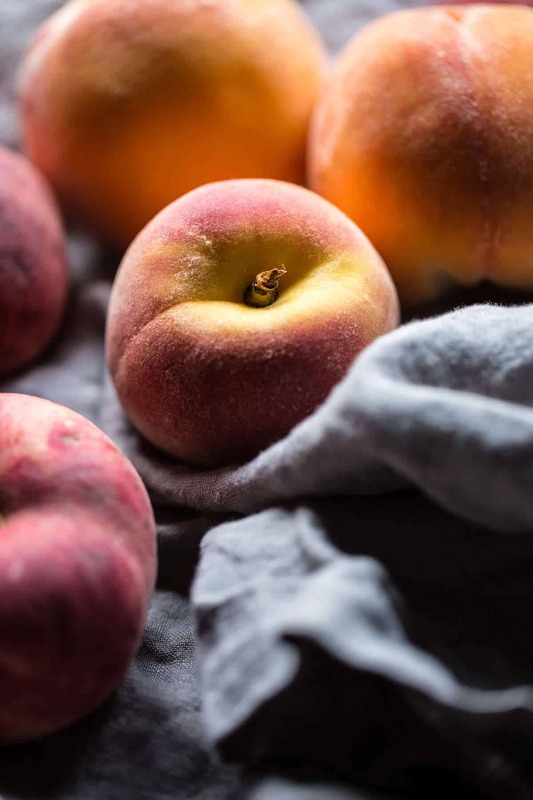 I’ve always peeled peaches before baking with them to avoid any peach skin bitterness– does it matter in this recipe? Yay-yuh!!! This is absolutely what my breakfast needs to be. 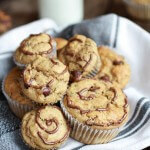 Muffins are always a sure way to brighten the the whole day, thanks for sharing these, Girl! WOO!! Soooo happy you’re loving these! Thanks so much Tori, enjoy!! 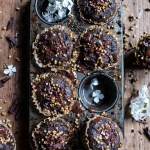 These look like the best muffins ever! I so need to make them while peaches are still in season! YES!! I hope you love them Lili! Thanks ? I made these this morning as i had everything it called for. Definitely confused with the directions as you mentioned coconut flour as well. So, with that being said i did everything as the ingredients stated, ( i only used 1/2 cup brown coconut sugar and that is all for the sugar) measured everything out and it was a thick paste…. so i added almond milk because i couldn’t get all the flour to mix. So far they look ok, and i tasted the batter and it was yummy. Baking quite nicely… cannot wait to taste these. I forgot to mention that i did not make the streusel as i did not have any more brown sugar. Hey Noel! So sorry for the confusion on the flour! There is no coconut flour in this recipe and I have fixed the recipe to read correctly. Hopefully they turned our amazing for you. Thank you so much! i have zucchinis from the garden and my dad just gave me a box of organic peaches from his garden. Destiny? YEs! WOW! Could not have been more perfect timing! Lol! I hope you love these! That sounds AMAZING! and like a perfect morning! I hope you love these Phyllis, thanks!! I hope you LOVE them!! Thanks so much Rebecca! Double the streusel always and forever! These peach muffins look spectacular. Haha thanks so much Nicole! I hope you love them!! Not only am I totally NOT sick of peaches (what kind of monster gets sick of peaches? ), I was coincidentally eating a peach while I read this post! Because I, like you, go shopping hungry and then come home with half the Whole Foods produce section. Haha yes! So happy you are not sick of them! Lol! Hope you love this when you get a chance to try it! Zucchini totally cancels all of the calories. 😉 What an interesting combo. Can’t wait to try it! LOL! I hope you love it Julie! Thanks so much! ? 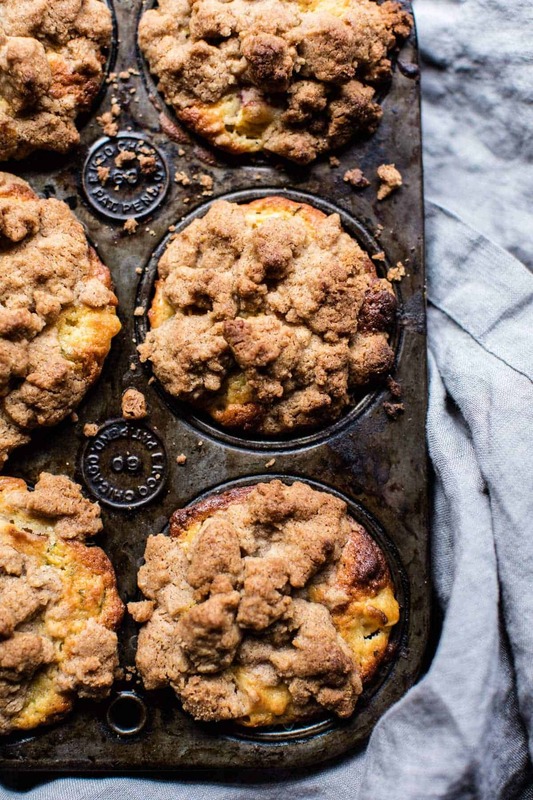 Yes please to double the streusel! These muffins are my dream! lol yes!! Thanks so much Laura, I hope you love them! These muffins look amazing!! I love the addition of Zucchini for some hidden veggies in the muffins. Can’t wait to give them a try! Right? Haha. Thanks so much Jess, I hope you love them!! I am already in an Autumn mood!! Autumn recipes are just so good and I am super pumped. Thanks so much Ema, I hope you have a good day as well! ? 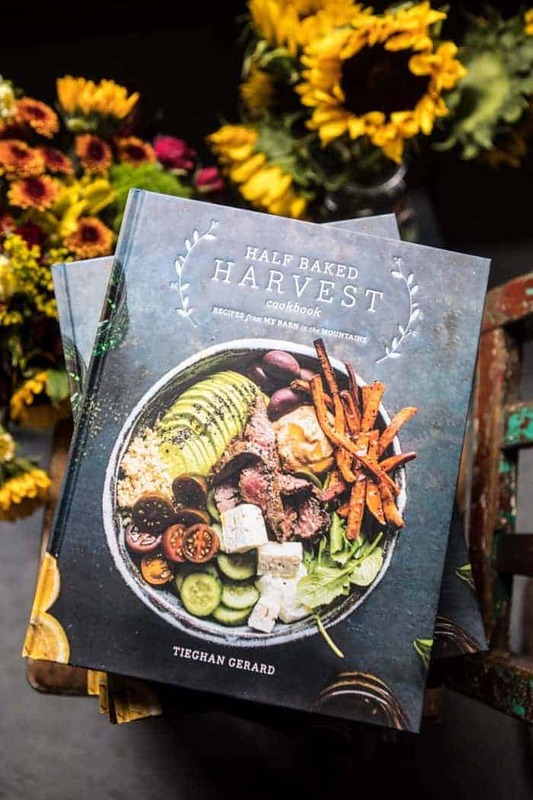 Hi Tieghan – Sounds delicious! Do you have any suggestions for subbing out the milk/yogurt for a dairy free alternative? Hey Kailey!! You can use any nut milk in place of the milk and I think coconut yogurt would be awesome in place of the greek yogurt. If that is not option, just use an equal amount of nut milk. Let me know if you have ay questions. Thanks! If you made it in a loaf tin, how long did you bake it for? Definitely making this later -peaches are the best!!! Hey Georgie, I am not sure since i have not baked the muffins this way, but I would guess around 45-55 minutes. Please let me know if you have questions. Hope you love this, thanks! Ugh I am sure those peaches will be sooooo good!! Yes ice cream sounds so good too, enjoy all that you’re making! ? 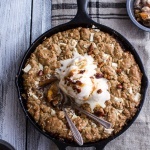 These look amazing, I agree that more streusel is the way to go, and it is sooo good with peaches! Right!! Haha I hope you love this Hannah! 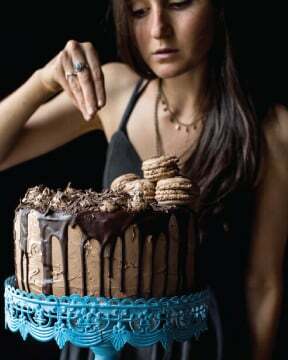 I would love to make this for someone who has a coconut allergy. Could I substitute the melted coconut oil with melted butter? Hey Allison! Yes, melted butter will work great! You can also use canola oil. Please let me know if you have questions. Thank you! i am so happy the muffins were still delicious Louise!! Thanks so much. ? These look AMAZING!! 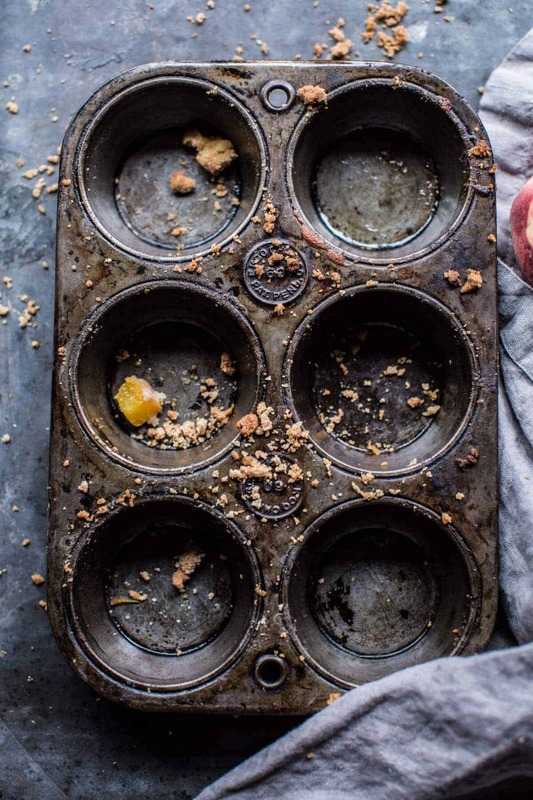 Can I use a loaf pan instead of a muffin tin? Hey Meghan! Yes, that will work great! I am not sure on the baking time, so just check around 30 minutes or so for doneness. Let me know if you have questions. Thanks! The look fantastic! Where did you get the muffin tin? Thanks Uli! I bought that at a vintage store here in colorado. You can find them on Etsy as well. I don’t think I could EVER get sick of peaches just yet at least! They are so delicious! They are!! Thanks so much Cassie! Looks delicious! Definitely making. 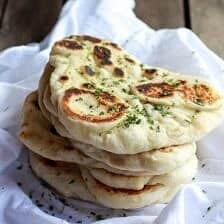 My sister is gluten free, how would using gluten free flour work? Hi Daisy, I just made these with gluten free flour — they’re absolutely delicious! Just be sure your flour has a one-to-one substitution ratio with all-purpose flour and you should be good to go. I am so happy you liked these Hannah! Thanks so much! Although somewhat off the subject, I’ve got to commend you on your fabulous photography. It’s some of the BEST I’ve seen…just so GOOD! 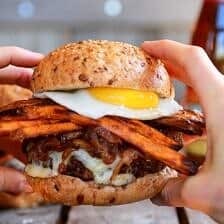 Can you recommend any good sources for learning food photography and/or styling? I am not in the business, nor do I intend to pursue this area in the near future. 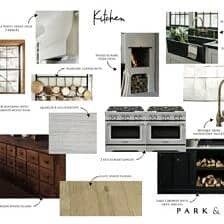 I simply LOVE to cook and share my creations with family and friends. Some have encouraged me to take it further, but I already have a long-standing unrelated business that I enjoy too much to give up. Besides, having food preparation as a hobby keeps ALL the fun in it without ANY of the pressure! I just made these and triple checked that I used the exact ingredients and followed the steps and somehow I got tons of very dry streusel (maybe used a third only) and the muffins took double the baking time. Perhaps try making these again to ensure there’s not a mistake? Really no idea what happened here… Certainly not my first time baking one of your recipes so I am surprised by this. Thanks. I live in an area where fresh peaches are not easy to find anymore. Can these muffins be made with frozen peach slices? They look soooo good! Yes, frozen peaches will be great. Don’t thaw them, just add right to the batter. Let me know if you have questions. Thanks! Hi Wendy! Frozen peach slices will be great. Just add the to the batter frozen. Let me know if you have questions. Thanks! Hi! I followed the directions exactly, and visually the muffins turned out beautifully, but despite cooking over 25 minutes (35 actually), the inside of the muffins are a bit too moist. Still delicious! But, Any recommendations on how to avoid this when baking with fruit? Thanks! These were great! Put the batter into silicone cupcake holders and placed in the muffin tin to bake. Used 1 large peach – about 1 1/4 cups diced (left the skin on), and baked for 30 minutes. Came out perfectly! Yay, sounds amazing, thank you for making it! Hello – could you make these in a loaf pan? 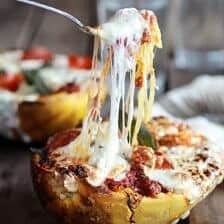 How would the recipe need to be altered? Thanks!